Boerboel Dogs - The Boerboel is a large working molosser type breed of dog from South Africa. The word boerboel is Afrikaans for "farmer's dog". The Boerboel as a true working breed has it's own complete and internationally recognised pedigree under the SABT South African Boerboel Breeders Association SABBA/SABT. They are obedient, intelligent, self-assured and bred to have an extremely strong guard-dog instinct in a domestic situation. Very selective and practical breeding ethic has created a very functional working dog, that is very dominant but thrives best in a reponsible family environment for which he can put his protective instincts into action when required. This information is licensed under the GNU Free Documentation License. It uses material from the Boerboel article on Wikipedia.org. 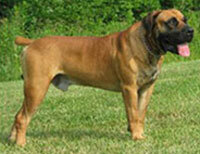 Boerboel Breeders - Advertise your kennel puppies and dogs here. Power's Legendary Boerboels - New Jersey - We are Boerboel breeders and breed for loyalty, health and courage.